Fall Asleep Forgettingfocuses an eclectic group of intertwined people living in a small Long Island beach town during one hazy summer. 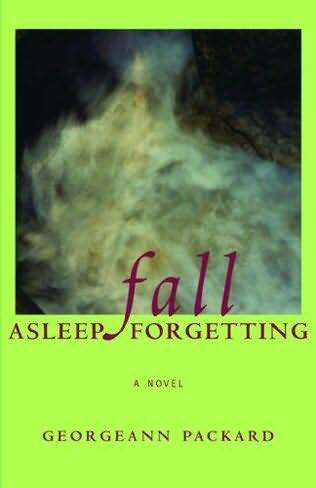 Once you start reading Fall Asleep Forgetting, Georgeann Packard’s dreamy poetic prose immediately draws you in to these intriguing characters she’s created. This quirky novel is laced with many provocative circumstances. Claude, a park ranger who works on the beach, is the link between all the different people. She’s friends with everyone although she’s relatively insular and quiet. She lives a simple life. Candy, a transsexual woman, runs the mobile home park. Her hunky guy is the object of a crush from libidinous older woman Rae. While Rae flirts away, her husband Sonny tends to look the other way and precocious 9-year-old daughter Six runs about independently and hangs out with whomever she wants, particularly Paul. He’s dying it turns out and planning his suicide on the beach, in his wife’s arms. In the meantime, he’s orchestrated an affair between his wife Sloane and Claude so that Sloane will have support when he’s gone. Though he’s taken into account his wife’s feelings and sexual cravings, Paul has failed to recognize the impact of his decision on the other closely knit folks. Forget reading some mindless chick lit novel; take this one to the beach instead. Fall Asleep Forgetting is full of lust, heated sexual encounters and intense emotions that stem from fresh and recharged connections. This entry was posted on July 12, 2010, 23:34 and is filed under Books. You can follow any responses to this entry through RSS 2.0. Both comments and pings are currently closed.